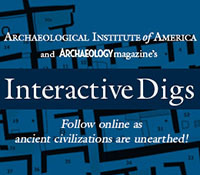 Coming from a variety of different universities and backgrounds, the students of the 2012 Johnson’s Island field school through Heidelberg University have now been excavating the Johnson’s Island Civil War Prison site for two weeks. The 11 students have been divided into four groups, each responsible for excavating a specific unit of the site. This summer, excavations have focused on the Block 8 prisoner residence and its corresponding latrine. Each unit is identified by a provenience number that is used to locate and differentiate the 2 meter2 units that each group is excavating. The numbers consist of positional coordinates representing how far away they are from a given datum point, which are reference plaques placed into the ground at specific intervals throughout the site. Many common artifacts are recovered every day, including brick, flint, bones, glass shards, and nails. However, occasionally well-preserved or significant pieces are found and specially recorded as field specimens (F S.). In this post, each group will discuss the field specimens that they have uncovered and discuss the background and importance of the specimens. Several of the field specimens found in Unit A have been related to prisoner clothing. Of those specimens, two of the more interesting ones have been buttons—a blue glass gaitor style button and a hard rubber button. 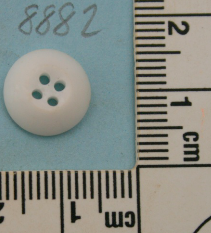 The gaitor glass button was a relatively unusual find, given the material and design of the button which indicate that it was possibly from a woman’s article of clothing. It was most likely used in prisoner costumes for plays or as a token to a prisoner from a loved one. Conversely, the hard rubber button, made from a moldable and durable form of rubber, was extremely common for the time and was found in almost perfect condition. The back of the button depicts the company’s name, “Novelty Rubber Co.,” and “Goodyear,” which indicates the name of the American who patented hard rubber in 1851. 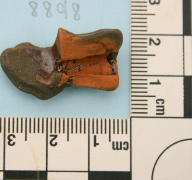 Other field specimens from the unit included fragments of two redware pipes, a type of ceramic common to the nineteenth century. 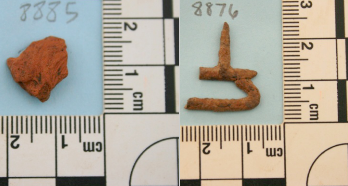 Additionally, part of a metallic suspender clasp and metallic belt buckle were found as well. These artifacts give insight into day-to-day prisoner life and fashion in the absence of materials such as cloth, which is not as easily preserved in the ground. We have been working for over a week and have been finding a few field specimens a day, including the first one of our field school which was the portion of a rim from a glass bottle. On our third day, Heidi made her first find in the form of a broken green glass bottle on the edge of the N244E146 provenience. Dr. Bush informed us this was an interesting find because it was a green wine bottle. 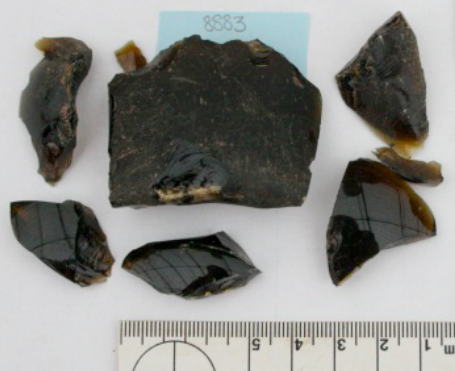 We are currently excited about another piece of glass that has yet to be fully excavated and lies on the edge of N242E146 and N242E144, Group C’s unit. The piece is a green bottle with a square base and, from what we can see so far, it seems intact. Allison’s most exciting find has been a beautiful piece of translucent orange chert. Chert is a form of flint that, when struck correctly, was used by Native Americans to make objects such as knives and projectile points. 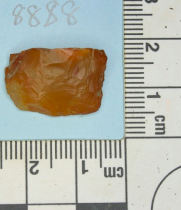 The piece Allison found has flaking on both sides to make the sides sharp and was most likely used for a projectile point or something similar by the Native Americans that inhabited the area in the centuries preceding the Civil War. The piece is the base of the projectile point with the top portion being lost. The orange chert is relatively rare and we are currently attempting to locate its origin. During the Civil War smoking was an everyday practice, particularly in the South where tobacco was grown widely on plantations. Though the prison on Johnson’s Island was originally intended to house both officers and enlisted men, within a week after its opening it was decided that the prison would hold only officers of the Confederate Army. The officers leading the Southern forces were most often gentlemen from well-to-do families who owned large estates and possessed both power and vast reserves of money. Prisoners could therefore draw on large sums of cash to purchase both tobacco and pipes while incarcerated, purchased from the sutler (a civilian trader) in the prison. Still more could receive gifts of the same from loved ones back home through the mail, which was delivered daily at 10:00 AM. Clay pipes were the most common form of these as clay was abundant, cheap, and easy to produce, and pipes were in high demand. Most were made of redware clay and unfinished, but some pipes were glazed with a brown color to conceal tobacco and ash. Hard rubber, a vulcanized form of soft rubber similar to modern plastic was highly popular at the time but was less common in the prison than clay. Some prisoners used hard rubber as a craft product to while away the long hours and would carve everything from jewelry to picture frames, and perhaps even pipes. Group C found several pieces of pipe including the bowls of two redware pipes, one of which shows the brown glaze sometimes applied. The other bowl is a base and shows the connection between the pipe stem and the bowl itself. 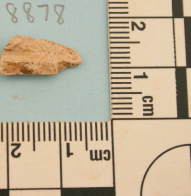 Furthermore, in close association with the pipe bowl base a kaolin pipe stem fragment was found, though it is not likely part of the same pipe. These were found in units North 244 East 144 and North 242 East 144. 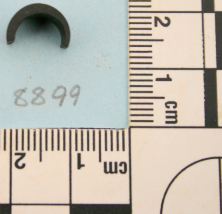 Also in unit North 242 East 144 Group C found a fragment of a hard rubber tube which may be from the manufacture of hard rubber jewelry, or perhaps a crude pipe stem. All of these indicate an attempt by the officers to replicate genteel Southern life within the confines of the prison walls. In this past week Group D has come across two interesting field specimens. In unit N244 E142 we found a white porcelain inkwell-shaped prosser button. This item was of particular interest to us because it was a reasonably common item for the Civil War time period. It is a symbol of everyday life in the prison and we felt proud to add it to the collection of other prossers that had already been built up. This gave Dr. Bush a great opportunity to teach us more about the different kind of prosser buttons from that period. It can be seen that the button was created out of a mold because of the orange peel-like quality it has on the bottom. This button has four holes like most prosser buttons. This artifact was found inside the unit when digging. It was noticed quickly because of the brightness of the color in contrast to the color of the soil. It was identified as an inkwell-style button because its shape is similar to that of an inkwell. Our next field specimen came from unit N244 E142 as well. This artifact was particularly fascinating because unlike the prosser button, it is a bit of a mystery. 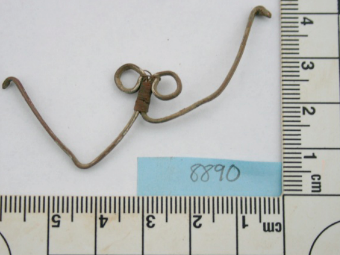 It is a silver plated copper spring object of unknown use. The shape is out of the ordinary because there are two pieces of metal that come together and form two loops at one end. There is also a metal spring that attaches the two pieces together. The two pieces extend on each side and look similar to arms. The very ends of each piece are bent inward. When looking at it closely under the magnifying glass one can see the silver plating coming off and revealing the copper metal underneath. Who knows what this belongs to? This entry was posted on Tuesday, August 14, 2012 at 9:13 am	and is filed under Field Reports, Special Finds. You can follow any responses to this entry through the RSS 2.0 feed. Both comments and pings are currently closed. I have studied the clay tobacco pipe industry for 35 years. 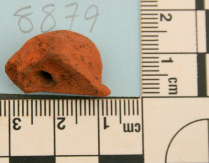 Your clay pipe fragment 8898 may have been made by John Taber of Wolfboro, NH. If you can send me a photo of the other side of the stem and the end of the stem I should be able to positively identify it for you. The end of the stems made by Taber always were cut off with a knife so they have a sheared ends. Taber made clay pipes from c1850 to 1912 at 4 different locations in Wolfboro. Really take pleasure in it! It seems like I seen something similar once in a museum. I’m thinking it possibly has something to do with a gas light or lantern. Not quite sure but you may want to consider this option. The silver coated device with the distorted arms could have been a minnie ball extractor before the arms were bent out of shape. I’m sure others have suggested the same. Definetly an extractor or holder of somekind. This is just like the extractors from todays times used to retrieve something from hard to get to areas. Silver plated might put it as medical ? As stated above a ball extractor ?